Philippe Claudel is a French writer and film-maker. While I’ve yet to read any of Claudel’s novels (which include Brodeck’s Report and Grey Souls), I am familiar with I’ve Loved You So Long, a film he wrote and directed in 2010. It features a standout performance from Kristin Scott Thomas as a woman struggling to adjust to a new phase in her life following an extended period of alienation from her family and society. 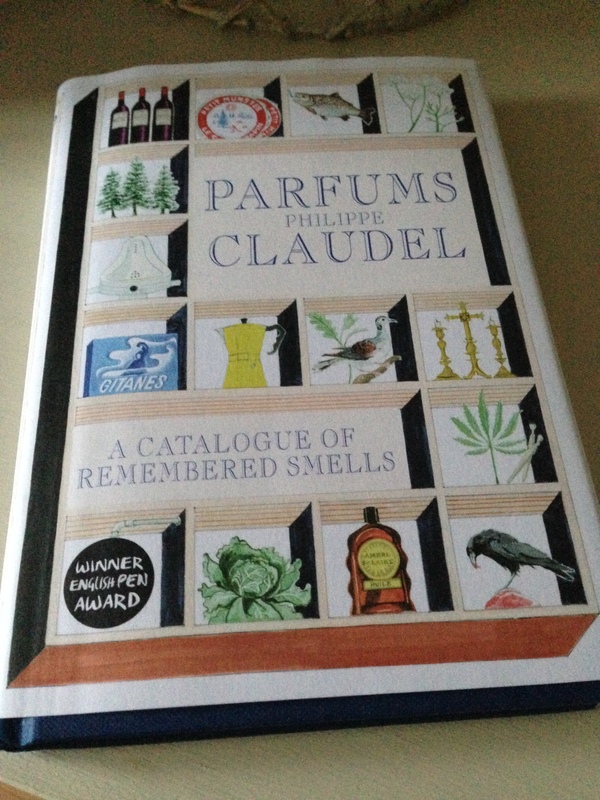 So when Claudel’s memoir, Parfums: A Catalogue of Remembered Smells dropped through my letterbox, I was keen to give it a whirl. This beautifully-written memoir consists of sixty-three vignettes each of which captures a scene or two from Claudel’s life, and it reads like a collection of memories, each one evoked by a certain smell. The title of each vignette represents the aroma concerned, and the topics range from floral (Acacia) to animal (Fried Bacon) to mineral (Pink Sandstone). Other smells capture places (Ironmonger) or particular stages in Claudel’s life. Gym, for example, reflects the author’s memories of the school gymnasium where young boys and girls brush up against one another and the odours of teenage hormones and feet mingle with the whiff of rubber mats. Rather than following a chronological path through Claudel’s life, the chapters move backwards and forwards in time. This movement gives the memoir a fluid, almost spontaneous feel leaving the reader free to guess what might be coming next. As you can probably tell by now, Claudel’s prose is very lyrical and poetic, so much so that these vignettes read like prose poems especially given the evocative and sensual nature of the parfums. Personally, I love the way Claudel writes although I appreciate his prose style might not be to everyone’s taste. If you like the passages I’ve quoted in this review, then there’s a good chance you’ll like Parfums. Less so if you’re not particularly fond of lyrical, poetic prose. Claudel offers the view that smells define us, they help us understand one another. In the modern world, there’s a tendency to tolerate only those aromas which are pleasant and socially acceptable, but by taking this approach we risk obliterating certain aspects of our character and experiences. Parfums is a celebration of smells both good and bad; it’s a celebration of life. Stu at Winstonsdad’s has also review this memoir. Parfums (tr. by Euan Cameron) is published in the UK by MacLehose Press. Source: review copy kindly provided by the publisher. This entry was posted in Book Reviews, Claudel Philippe and tagged #TranslationThurs, Book Review, Euan Cameron, Fiction, France, Literature in Translation, MacLehose Press, Philippe Claudel on October 14, 2014 by JacquiWine. Great. I think you’ll love this Helen, especially if you’ve read and enjoyed other Claudels. I’m sure it will be a delight to experience this in French. Hats off to Euan Cameron for an excellent translation, though, as the English version reads so beautifully. I definitely want to read some of Claudel’s fiction now. It is a lovely little book, one that would make a beautiful gift for someone (or a treat for yourself). I’ll be interested to hear how you hear get with your recent purchase of Claudel’s Brodeck’s Report; one or two others recommended it to me when I tweeted about Parfums last week. I love your commentaries Jacqui. You really seem to capture the important things inherent in a book. The ideas of a series of vignettes based upon memories of aromas is a great idea. I have often detected a smell that brought back memories and after reading your commentary I will likely be so more often. Thank you, Brian. I really appreciate you saying this. As one might expect, there’s a nostalgic thread running through these vignettes, but the feeling of loss (in its varying forms) came through very clearly to me. I love the idea behind this memoir, too, and smells are such an evocative trigger of memories, aren’t they? One of my earliest memories is the aroma of a chicken roasting for Sunday lunch, and one of Claudel’s vignettes on the smell of fir trees reminded me of childhood trips to England’s New Forest. What a brilliant conceit for a memoir! Many thanks for drawing attention to what sounds like a fascinating book. I must keep an eye out for it, assuming it ever reaches these shores. Very welcome! It is a wonderful theme for a memoir and a beautiful book to dip into each day. And as you read, you start to think of your own personal memories and associations with particular smells. I hope it does make the trip stateside as it deserves to reach a wide audience. Did you see those study which noted that loss of smell can indicate early Alzheimers? Anyway, I have a few fiction novels by this author I should read first. This memoir left me keen to try something else by Claudel, so I’m looking at his fiction at the moment. Brodeck’s Report sounds excellent (and a couple of others have recommended it) so I might go there. Thanks, Nano. You’d love this one – I’ll put it aside for you to borrow! I’m glad someone shows something positive about Lorraine for a change. Grey Souls is rather bleak, it’s a great candidate for a bleak read if you’re still looking for one. I don’t know the area at all, but Claudel conveys very happy memories of the Lorraine countryside and trips to the Vosges forests. He still lives in the town where he was born. A couple of vignettes touch on how the place has changed over time with small independent shops and traditions giving way to larger anonymous stores, but I guess that’s inevitable. Thanks for the recommendations, Emma. The Delerm looks interesting, and I can see similarities with Parfums. I definitely want to read something else by Claudel, maybe next year as my tbr pile is out of control at the moment! I like the idea for a memoir but have a feeling I might find this overwritten. It;’s hard to judge on small quotes, though, as I know that prose can take time to get to you. I’ve often disliked the opening chapter of a book only to reread it after finishing, and liking, the book and enjoying the opening second time around. This style won’t appeal to everyone, Seamus, and I found it best to read 3 or 4 vignettes at a time…otherwise the beauty of these passages can start to become overwhelming. It’s a little like visiting an art gallery and being surrounded by a multitude of beautiful paintings. After a while, it becomes increasingly difficult to appreciate each piece on its own terms, and you find yourself getting maxed out on art. It is difficult to judge, though, and I know what you mean about giving some prose/books time to seep into your consciousness. I had to start one of David Mitchell’s books three times before taking to a certain style. I liked Grey Souls a lot but it is bleak. In a beautiful way though. This sounds wonderful. I see if I can get it in French. I’m fascinated by sense memories. I’m interested in Grey Souls as it sounds haunting but beautifully written. It looks as if MacLehose Press will be issuing a new edition next year, so I’ll keep an eye out for it. If you like sense memoirs, I think you’d enjoy Parfums. It’s a good one for dipping into by reading a few vignettes at a time.